A number of people have asked us to spend time arguing with them. Let me tell you why we won’t. While they were holding their webinar, we had interns, staff, and speakers in town for activities on the Hill, and were preparing for FFL’s Annual Capitol Hill Intern Briefing. While abortion advocates were busy denying our existence, we were talking to collegians from across the country — from Berkeley to the Ivy leagues, Texas Tech to Notre Dame. Students even came from St. Andrew’s in Scotland and another from France. Students from both sides of the aisle and both sides of the divisive debate heard from FFL member Johanna Young, a victim of domestic violence who was coerced into an abortion, and FFL speaker Joyce McCauley-Benner who was raped and chose victory over violence. They also heard from Carol Day, Director of Health Services at Georgetown. She has been a panelist at every FFL Pregnancy Resource Forum since the beginning. And while we’ve been taking this program to students, and through them organizing administrators for the Forum, Carol has been educating her peers. Then Kara Sorenson stepped forward. 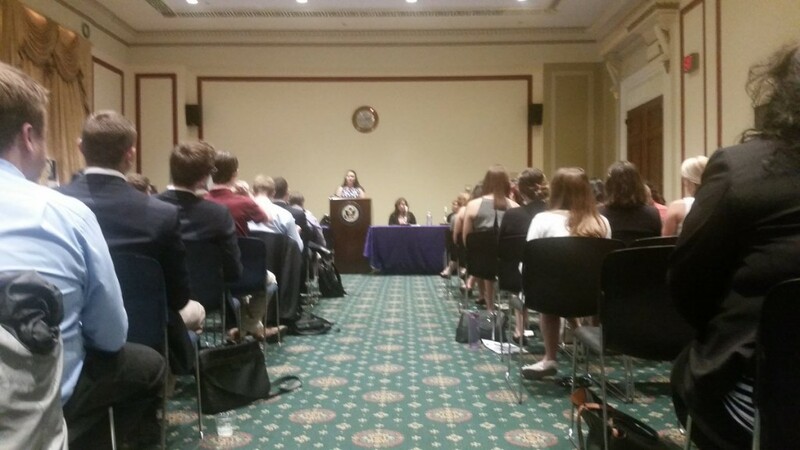 Kara, one of our three summer interns who had been visiting Hill offices that week sharing our pro-life feminist history (original research documented by FFL), and “Pro-Woman Answers to Pro-Choice Questions” to Hill staffers. Kara talked about her experience organizing an FFL Pregnancy Resource Forum at Clarion University. In just two hours, thanks to a dozen dedicated administrators, community service providers, and a devoted advisor, pregnant women, expectant fathers, parents, and birthmothers will be able find comprehensive help at Clarion and through the community..
You’ll have a chance to read their testimonies in the next few weeks. But today is really special. 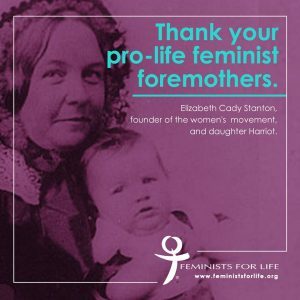 On the anniversary of the Seneca Falls Convention, we pay special tribute to Elizabeth Cady Stanton, founder of the suffrage movement, mother of seven, and yes, a pro-life feminist. We have yet to realize the unfulfilled dream of the first wave feminists — to address the root causes that drive women to abortion. And as beneficiaries of the first wave who advocated women in higher education, FFL is focused on reaching bright young minds when they are eager to do something real, something tangible, something revolutionary to truly help someone else. We are the ones, thanks to generous past support, who was able to send “First Wave Feminists” an issue of The American Feminist to thousands of gender studies professors across the nation. You know that if abortion advocates are pointing at us, we must be doing something right. This is just one more indicator that we are at the tipping point. Instead, we aim to make abortion unthinkable through resources and support. As a nonsectarian and nonpartisan organization, we are uniquely able to reach those at highest risk. 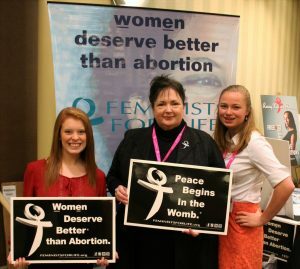 Our feminist credentials are unmatched in the pro-life movement. That’s one big reason why when students come to protest us, they end up respecting us, and most importantly working with us. When we go to campus we aren’t there to talk to ourselves — or cause a fight. We are there to reach out, to reach across the aisle, to reach past a divisive debate, and yes past the hurt and the anger. We do this with a better vision for the lives of women and children. FFL interns Kara Sorenson, from Clarion University, (left) and Madeline Davin from Wheeling Jesuit (right), pose with FFL President Serrin Foster at the FFL booth at the first-ever Pro-Life Women’s Conference in Dallas. In Dallas, we recently had the opportunity to share our vision, our mission, and our rich pro-life feminist history with 550 women at the first-ever Pro-Life Women’s Conference. For those who weren’t able to join us, I want you to know that it was a weekend of incredible sisterhood. It was our Seneca Falls Convention. Some of the women there, longtime Feminists for Life, are inspired by our work too. And they have offered to DOUBLE-MATCH any new or increased monthly gift. With the expenses of getting speakers, interns, and staff to both the conference and the Hill Briefing, things are extremely tight. And while we are smart and strategic, we can’t do our work without funding. So please, on this anniversary of the Seneca Falls Convention in 1848, after all the signs that we are at the tipping point, please make a special gift to FFL right now. Make a sacrifice that is meaningful to you and to those we serve. And yes, we welcome abortion advocates to reconsider abortion and we would welcome them to our movement. We want everyone to share in our rich pro-life feminist legacy. PS. Please carefully consider the sacrifices made by our feminist foremothers for us. Starved, beaten, strip searched, force fed. One was hung from a handcuff overnight. Some lost their lives. Think about what you can sacrifice to help us reach more women at risk and provide more meaningful programs to help make abortion unthinkable. Thank you for walking in their shoes.